We’d love your help. Let us know what’s wrong with this preview of Why We're Not Emergent by Kevin DeYoung. You can be young, passionate about Jesus Christ, surrounded by diversity, engaged in a postmodern world, reared in evangelicalism, and not be an emergent Christian. In fact, I want to argue that it would be better if you weren't. The Emergent Church is a strong voice in today's Christian community. And they're talking about good things, like caring for the poor, peace for a You can be young, passionate about Jesus Christ, surrounded by diversity, engaged in a postmodern world, reared in evangelicalism, and not be an emergent Christian. In fact, I want to argue that it would be better if you weren't. The Emergent Church is a strong voice in today's Christian community. And they're talking about good things, like caring for the poor, peace for all men, and loving Jesus. They're doing church a new way, not content to fit the mold. Again, all good. But there's more to the movement than that. Much more. Kevin and Ted are two guys who, demographically, should be all over this movement. But they're not. And here’s why—they do life founded upon orthodox beliefs about God, propositional truths about Jesus, and the authority of Scripture. In Why We're Not Emergent, Kevin and Ted diagnose the emerging church from both a theological and an on-the-street perspective. They pull apart interviews, articles, books, and blogs, helping you see for yourself what it's all about. To ask other readers questions about Why We're Not Emergent, please sign up. It's funny reading some of the reviews from the emergents. They have barely any substance to their reviews and mostly engage in name-calling. One "reviewer" said the two authors of Why We're Not Emergent: By Two Guys Who Should Be seemed to lack "education and experience, judging from their arguments." Of course, any critical interaction with their arguments was, as you might expect, missing. Furthermore, I don't even know what that accusation amounts to. What doth experience hath to do with arg It's funny reading some of the reviews from the emergents. They have barely any substance to their reviews and mostly engage in name-calling. One "reviewer" said the two authors of Why We're Not Emergent: By Two Guys Who Should Be seemed to lack "education and experience, judging from their arguments." Of course, any critical interaction with their arguments was, as you might expect, missing. Furthermore, I don't even know what that accusation amounts to. What doth experience hath to do with arguments? Arguments are good or bad if they are valid or invalid, sound or unsound, cogent or uncogent. It's not like you need to sleep around and snort coke like Scarface in order to put forth a good argument. Yeah, you'd be "experienced", but that doesn't mean you need to do that to have a good argument. Or is this the wrong way to take "experience"? I confess, I don't know how to take it, vague, ambiguous, and prima facie irrelevant as that word seems in this context. Another reviewer critiqued Ted Kluck with some odd false dichotomy which implied that if the emerging church was just a gnat on the Christian landscape, then you wouldn't pay attention to it; or, you're just upset at losing some of the market share to Rob Bell. The reviewer topped this off by using a capital "T" for the word truth (how hip and po-mo, and just plain witty), as if that was a critique, and made some comments that total depravity and penal substitution made for a "bleak worldview." Well, there's always the Disney worldview. Not sure how true it is, but at least the oceans are made of chocolate milk. It may not be true, er, True, but at least it aint bleak. I guess these examples serve as paradigm cases of how emergent-type people "engage" those they disagree with? I wouldn't know, I find it good for the soul to not "engage" with po-mo emergent types. It all reminds me of those parties where the stoned guy asks what is the sound of one hand clapping and all the rest of the partiers think he's deep. I thought the book was good and the dynamic between the two authors, each authoring alternating chapters, made for a unique reading experience. DeYoung's chapters were more "scholarly" while Kluck's really fulfilled the aim of the title -- he's just a regular guy who "should be" emergent. Of course a seminary trained Reformed pastor wouldn't be emergent, he's been brain washed. But what about some dude? Some dude who seems to have a fair amount in common with emergent types? Why doesn't he dig your way of doing "church" (emergents don't really call it "church" anymore. That's kind of uncool. People want "love fests", or something)? The authors succeeded in showing why they are not emergents, and they did so for reasons. Reasons that were argued for. They cited numerous statements by emergents, which should show any Bible believing Christian the dangers of the "movement" (but I guess they don't want to call it a movement. I think they like "discussion"). Of course, I have seen many reviewers claim that the authors attacked straw men. Well, I saw them interact with lengthy quotes, and none of the reviewers bothered to put the quotes into context and so demonstrate the charge of straw man burning. The authors take time to point out some of the good concerns emergents have. They give them a nod when they see a valid complaint. But where the emergents are off, they're really off. One of the main complaints DeYoung and Kluck have is that emergents are too skeptical of doctrine and propositional truth. They point out that propositional truths are very important in the Bible. Salvation comes by believing in a historical person and what he did. Trusting and resting in actual things he accomplished in history. These truths matter, and so do stating the doctrines properly. Emergents never want to get pinned down it seems. They never want to affirm anything, other than "the church got it all wrong for two thousand years" and "holding to doctrines as the truth is dogmatic and arrogant." But like all po-mo and relativist types, these claims just seem self-defeating to me. Deyoung and Kluck point out that it's really not intellectually virtuous to throw out Christian doctrine and claim some kind of skepticism or ignorance in the name of "humility." My only complaint is that I wish there had been more of a philosophical analysis of the emergent church. So far it seems to be mainly theologians interacting with the emergent church. Anyway, I would recommend this book if you are thinking about becoming emergent or have friends who are. I'm not sure it would do much good in the hands of an emergent Christian; after all, we got a glimpse of how they butchered it and treated it in my opening paragraphs. I could also be wrong about emergents, and wouldn't mind being corrected and shown that they are confessional, or at least hold to an identifiable set of positive doctrines, about the way things are. About how man is saved, and what happens to him when he dies. Stuff like that. The emergent church is an emotional and controversial topic. One of the latest books in the emergent "conversation" is Why We're Not Emergent(by two guys who should be). The book has an intriguing title and a very emergent-looking cover. But the best part is that there is substance and style to this manifesto. DeYoung and Kluck, as the title claims, are perfect candidates for the emerging church movement. They prefer, however, traditional church, and spend a good portion of the book explaining w The emergent church is an emotional and controversial topic. One of the latest books in the emergent "conversation" is Why We're Not Emergent(by two guys who should be). The book has an intriguing title and a very emergent-looking cover. But the best part is that there is substance and style to this manifesto. DeYoung and Kluck, as the title claims, are perfect candidates for the emerging church movement. They prefer, however, traditional church, and spend a good portion of the book explaining why. They also delve into the teaching of many "emergent"(I use quotations because some of the authors they cover aren't quite emergent) authors and the errors of their arguments. I enjoyed this book, though I disagreed with the authors on many points. But they seem to come at the topic with clarity and distance, which was something that was refreshing. This isn't an assault on emergent culture. It is a point by point declaration of the authors' faith, and how that faith is similar to traditional Christianity and different than "emergent" Christianity. Two of the topics I enjoyed the most were the chapters on Modernism and propositional language of the Bible. The authors quote liberally from the Bible and emergent books, so the amount of research done is impressive. I'm still in the middle of this one, but its obvious that these two are missing the point. The emergent church is a healthy response to the long stated rigid theology of evangelicals. I think the two authors are re-enforcing the message of the emergent church in this text. I also think they lack education and experience, judging from their arguments. A thoughtful addition to the conversation on the 21st century church and the emergent movement. Ted Kluck and Kevin DeYoung carefully examine the triumphs and failings of the emergent movement and what it means for the future of western Christianity. I liked the way that they were careful to praise the wonderful things that this movement has brought to light, and very respectfully presented the areas where the vagueness and gray area leave us wanting. This was a very helpful book for me personal A thoughtful addition to the conversation on the 21st century church and the emergent movement. Surprisingly relevant and helpful to me even though the "emergent church" conversation is largely over. This is an important book. I have read a couple popular emergent titles [Blue Like Jazz, Velvet Elvis:] and was proufoundly impacted by parts, but a bit unsettled by other parts. The authors here are quick to applaud the emergent conversation when it issues needed correction to evangelicalism. But they offer a stinging indictment when the emergent discussion wanders from the faith. Well researched and well crafted. Does offer a few decent critiques of Emergent (and a few bad ones as well), but what they would replace it with is often undesirable. I'm also unconvinced that they understand Emergent that well. Good introduction to the emerging movement. P. 218-222 alone are worth the read as is the epilogue. It is a balanced, fair, theological and witty critique of the movement and your own church. I get really confused when I hear the term EMERGENT. This book helped me to clear a lot of that up. EMERGENT is essentially the latest form of liberalism. In fact, it is so liberal that it’s extremely difficult to nail down a firm definition. Kevin DeYoung writes, “Defining the emerging church is like nailing Jell-O to the wall.” Emergent Leaders often refuse to take a stand on controversial issues like Hell, Original Sin, Atonement, Exclusivity of Christ, Authority of Scripture. Their silence s I get really confused when I hear the term EMERGENT. This book helped me to clear a lot of that up. EMERGENT is essentially the latest form of liberalism. In fact, it is so liberal that it’s extremely difficult to nail down a firm definition. Kevin DeYoung writes, “Defining the emerging church is like nailing Jell-O to the wall.” Emergent Leaders often refuse to take a stand on controversial issues like Hell, Original Sin, Atonement, Exclusivity of Christ, Authority of Scripture. Their silence speaks volumes. 2. The Christian life requires less doctrinal reflection and more personal introspection. 3. God is too big to understand. 4. Truth is too mysterious to know with certainty. 5. We want to embrace mystery, rather than conquer it. 6. We need to trust God more than our beliefs (doctrines) about God. 7. We worship the Word made flesh, not the words on a page. 8. The Bible isn’t the Word of God, but simply contains the Word of God. 9. The authority is not in what I say the text says, but in what God says the text says. 10. Spirituality is hot and religion is not. 11. The Gospel is an event to be proclaimed, not a doctrine to be preserved. 12. The question is not, do I believe in God?, as much as does God believe in me? 13. A better question that who’s right is who’s living rightly? 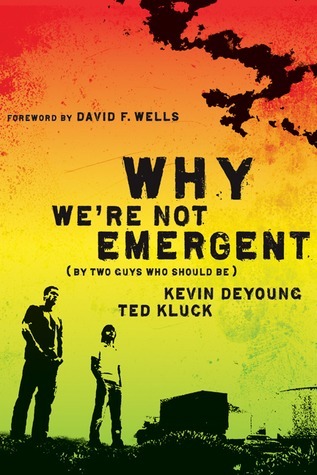 Kevin DeYoung and Ted Kluck take turns writing the chapters of WHY WERE NOT EMERGENT. DeYoung is more the scholar and Kluck is more practical with his observations. You can probably get the main message by just reading the chapters DeYoung wrote, but I found that the chapters Kluck wrote gave my brain a rest in between DeYoung’s chapters. Each chapter was heavily footnoted and both authors back up their points solidly with Scripture. Both authors also point out that their intention is not to demonize or question Emergent’s love for Jesus, but rather to point out some serious flaws in their thinking. This excellent book, written tag-team by the two authors with alternating chapters, does two very helpful things. First, they do their best to define who comprises the "emergent" or "emerging" church, settling on a list of people including Brian McLaren, Rob Bell, Spencer Burke, and others, who seem to be saying roughly the same things, endorse each others books, and sometimes make joint statements. Once that is settled we learn, by examination of the writings of these people, exactly what it is This excellent book, written tag-team by the two authors with alternating chapters, does two very helpful things. First, they do their best to define who comprises the "emergent" or "emerging" church, settling on a list of people including Brian McLaren, Rob Bell, Spencer Burke, and others, who seem to be saying roughly the same things, endorse each others books, and sometimes make joint statements. Once that is settled we learn, by examination of the writings of these people, exactly what it is that "emergents" believe - and, in many cases, why it is wrong. The authors don't do this, but perhaps you could put most of their criticisms into two categories - bad logic, and bad theology. First, the leaders of the emergent church are bad logicians because they routinely present false dichotomies or work with vague definitions. So, for example, emergent types often emphasize the mystery of God, to the point of actually questioning whether we can have any real knowledge of God in the first place. Instead, they say, it is more important to focus on having a relationship with God, rather than trying to make propositional or creedal statements about him. But this is nonsense. To have a relationship with someone is to know things about them. To know things about them is to be able to make propositional statements about them. We cannot focus on relationship with God while ignoring propositional statements - indeed, we must do both. And, suggesting that we cannot really know God is bad theology as well - the Bible, inspired by God, is filled with statements describing his character. The theological problems are just as great. DeYoung refers to one of the bigger theological problems as the "boundary problem" - if emergents have a hard time telling us what they believe, they have an even harder time telling us what they don't believe, or what they believe is wrong. Examples range from refusals to say that homosexuality is immoral to affirmations of quasi-universalism that make conversions to Christianity unnecessary and the cross of Christ unimportant. The impulse behind this wishy-washiness probably isn't all bad - they want to have inviting churches. But in the end, refusing to tell people that the way they are living is wrong, that the things they are believing are wrong, doesn't help anyone. This is just a taste of what the book discusses. I should add that the authors don't think emergents are working with malicious intent. In fact, they think that in many cases they have noticed real problems with many American churches (like focusing on doctrine but neglecting love for others, for example), but that the emergents themselves have responded by erring much too far in the other direction. That said, I think that Kevin's chapters were definitely more substantive. He had tried to engage the louder voices of the emerging church movement by reading a good number of their books. And he has come to a difference of opinion theologically and believes that reformed theology is the place to go... a la Piper, D.A. Carson. (Don't know if he would endorse Mark Driscol, but Mark's kind of a different animal anyway. http://www.nytimes.com/2009/01/11/mag...) While I may hold to some different theological positions as Kevin, he has indirectly spurned me on to inquire about the neo-reformist movement in the states and the "truth propositions" to which they ascribe to such as total depravity of man, sola scriptura, predestination, a wrathful eschatology, and penal substitution. All of which combine to create a very bleak cocktail of a worldview which is alluring to some. But he may rightly bring up a few valid issues with ec such as biblical references about homosexuality and assert that many in the emerging church are "ducking the issue." I think that this is an excellent example of what he calls "critiquing the emerging church is like nailing jello to the wall" because you will not find anything close to a consensus on this issue within the emerging church movement. i would rather be true to scriptures than hip. start with Truth and then allow the Holy Spirit to make it relevant--don't make relevance and broad acceptance the principle goals. Great book, written smartly (and occasionally smart alecky!) discussing the strengths and weaknesses of the emergent church. I have to be honest. I didn't like this book. I would not classify myself as "emergent." But I do think that I have a sympathetic disposition toward the "movement." I think they are saying some good things. I don't agree with everything but I think their critique is going to have to be understood and the greater church will have to respond. Which leads me to my primary problem with the book. The authors demonstrate the chronic inability to listen. I can't deal with everything I didn't agree with I have to be honest. I didn't like this book. I would not classify myself as "emergent." But I do think that I have a sympathetic disposition toward the "movement." I think they are saying some good things. I don't agree with everything but I think their critique is going to have to be understood and the greater church will have to respond. Which leads me to my primary problem with the book. The authors demonstrate the chronic inability to listen. - Wrongly identifying the "emergent" church with liberal protestantism. - Maintaining the status quo. I will deal with these issues and then speak to what I did like about the book. But before I do that I have to mention some stylistic issues that just bugged me. While I didn't agree with most of the book I generally enjoyed the well reasoned arguments and dealings with significant issues in the debate. The only time this wasn't the case was for all the even chapters. I read chapters two, four and six and was compelled to give up because they were an intolerable waste of time. What I gleaned from these chapters was that "emergent" Christians are simply immature and once they get married and have babies they will see the light of reformed theology and will be willing to participate in "big boy" church. I also learned that "emergent" Christians are stupid enough to like "emergent" leaders because they are younger and better looking then intellectual giants like J. I. Packer, John Piper and D. A. Carson. In chapter four, Kluck sits in a car with D. A. Carson and discusses the pros and cons of blogging. When you sit in a car with D. A. Carson while you are writing a book about the "emergent" church and talk about whether he likes blogging, that fact makes you a sports writer. It shows an unjustified concern over inane biographical details that would command the attention of a reader that already knew the statistics of their favorite quarterback. In that same chapter, Kluck attempts to climb the highest peek of irony when he talks about the benefits of an editor. This was one of the few statements in the book for which I was in unqualified agreement. It made me wonder if this book would have benefited from the same process. Now onto issues that aren't petty in nature. This was the most aggravating claim that weaved its way through the whole book. This claim made me think that the writers simply didn't understand or were ignorant of both movements. The claim that liberal protestantism is the same as the "emergent" movement is simply wrong. The philosophical underpinnings of both are so radically different that it cannot be the case. It would be like saying that Eisenhower and Hitler are the same because they both built interstate highway systems. Its true that they both offer similar critiques to "conservative" Christianity but that is where the similarities end. Liberal Protestantism was a direct reaction and incorporation of the Enlightenment. It demystified the Gospels, taking out the miraculous, making God the clock maker and Jesus the moral exemplar. It christianized the idea of human progress completely through human reason and couched it in biblical language. The "emergent" movement takes its cues from postmodern philosophy which is the antitheses to enlightenment's idea of human progress. Postmodernity has called into question and has a general incredulity toward everything that the Enlightenment (and Modernity in general) was about. To compare them and call them the same is foolish because it just ain't true. To be fair, I see how easy it would be to confuse the two. The "emergent" church doesn't have a strict adherence to doctrine which would make them prime candidates for banishment from any conservative congregation. The only other option is to go to a liberal protestant church (or one that doesn't have the doctrinal preoccupation that the conservative church does). This would tend be your mainline churches (note: I don't think mainline churches are overwhelmingly liberal, but they differ in outlook from conservative churches in general). At which point the "emergent" views on social justice become identified with the liberal agenda. Why I think it is inexcusable for the authors to make this claim is because they simply didn't listen to self described "emergents" who clearly express a strained relationship with both the conservative and liberal churches. They don't fit into either camp so they tend toward the only camp that will accept them. The other option is to form there own groups, meetings, or cohorts which garner less respect then the first option. The authors have scanned the text and found the quotes to support their position but in the end missed that which was most important, the motives behind the claims. Having wrongly dismissed the philosophical underpinnings of the movement the authors simply write off any critiques to the status quo, which allows them to toe the conservative line without much reflection on their part. I would say that the "emergent" critique of the conservative church has been primarily oriented around a heaven focused, growth oriented, politically republican agenda. They have made it obvious that social justice is apart of the gospel and that the people of God must take action in light of this demand. But the authors of this book try to make any endeavor to feed the poor or create world peace suspect of promoting the politically liberal agenda. Regardless if Jesus thought it was a good idea or not. He even goes so far as saying that people on "both sides of the aisle" need to be careful of over identifying Jesus with their politics. But not even a page later he is back to square one saying that we should be concerned with abortion and gay marriage and comparing all other political implication of the gospels with Rauschenbusch and liberal protestantism. What makes this infuriating is that the authors themselves say that actions like feeding the poor are important but when it comes from the lips of an "emergent" it is just liberal. Why not simply affirm that they are correct and be done with it. Why not hear the critique and affirm they are correct. I don't think that the conservative church has wholly ignored social justice. I have been apart of churches that have supported food banks and done similar missions. I have also over heard congregants that have found every excuse they can find under the sun to not give to the poor. Homeless shelters have required the listening of gospel presentation prior to eating and I have even heard of soup kitchens changing their mission to exclusively evangelism because they felt that the food drew from the preaching of the word. While not every church fits into this critique I think that the "emergent" church has a point here. Doesn't the gospel require us to feed the hungry, clothe the naked and visit the imprisoned? Then why throw stones at those who bring this truth to light. My final critique is that the authors seem to have a broad idea as to who counts as "emergent." When you place McLaren, Miller, Grenz, Raschke, Pagitt, Campolo, Bell, and Friesen all in the same camp you appear to be the proverbial monkey throwing your feces at anything in range. It is true that some of these guys associate with each other but it is certainly not true in every case and I didn't see any attempt to deal with how they differ from one another. Without a doubt the authors care about the church and the preservation of the message of redemption that is offered in the Bible. They see the rejection of doctrine as a sure sign that this message will get lost. I think that doctrine is important and that the "emergent" church has in some cases thrown the baby out with the bath water. The "emergent" church has rejected doctrine because they needed to deconstruct the church and its mission, but you can deconstruct forever and never manage to do anything of value. At some point they are going to need to reconstruct what church is for, who Jesus is and what our mission is. I am hopeful that the conservative church will hear the critiques, offer some alternatives and help the "emergent" church reconstruct their theology. I think that it will be give and take. I think that doctrine and scripture will play a different role then it has in the past or at least the current idea will be nuanced a bit, but I don't think it will be at the expense of orthodoxy. Orthodoxy is no worse or better than orthopraxy but another important aspect to a faith that everyone in this debate cares about. One specific case in which I agreed with the authors is in some of their arguments for the doctrine of hell. I don't think you can read hell out of the text and I think that "emergent" and even evangelicals in general get a bit squeamish when it comes to preaching about hell. One critique that I found to be relevant was in reference to authority. I think it is a fair criticism to say that the "emergent" church is skeptical of authority and I would say that this has come from that authority being abused at times. Even so authority is part and parcel to life let alone the church. It needs to be incorporated and understood in the right context but it cannot be eliminated. Kevin DeYoung is an interesting character in evangelical Christianity. Coming from a strong reformed tradition, he is turning heads by becoming involved in big projects with the Gospel Coalition. He considers himself "Young, Restless, and Reformed," a movement that stems from millennial's coming into the Church holding onto important tenants such as expository preaching and election. Interestingly enough, the early 2000's produced a movement of evangelical Christians that tried to appeal to mille Kevin DeYoung is an interesting character in evangelical Christianity. Coming from a strong reformed tradition, he is turning heads by becoming involved in big projects with the Gospel Coalition. He considers himself "Young, Restless, and Reformed," a movement that stems from millennial's coming into the Church holding onto important tenants such as expository preaching and election. Interestingly enough, the early 2000's produced a movement of evangelical Christians that tried to appeal to millennials by producing hip pastors with soul patches, fancy coffee drinks, and contemporary music. Most importantly, they embraced existentialism and shy away from strict doctrinal stances that seem to them an anachronism. This movement was called the "Emergent Church," and for awhile they posed a great threat to Christian Orthodoxy. DeYoung partners with Ted Kluck to investigate this movement, what they believe (or don't believe) and how it is effecting Evangelical Christianity. They admit it is a hard task to undertake. Perhaps this is because emergents are unequivocally mysterious about what they claim to believe in particularly on doctrinal issues. For example, no where can you read Brian McLaren's stance on homosexuality. Is it right or is it wrong? Emergents thrive on ambiguity and embrace spirituality, not religion. They are big proponents of the social gospel: the thought that making a change in the world by doing is better than sitting in coffee shops debating theology. Theology and doctrine are the enemies to the emergent. What does it matter if you deny the trinity? What does it matter you deny the virgin birth? Shouldn't Christians be getting out and showing the love of Jesus instead of sitting on their knowledge, their fat, obese intellect, and doing nothing for the world? DeYoung provides an interesting look at the Church at the very end of the book. He comments on the Churches from Revelation. These Churches were real at one time and had these problems he lists, but the metaphorical nature of the Church can help diagnose problems in our Churches today. He essentially breaks down a swing which is too extreme in both cases: in the first, churches are too intellectual and have little emotion, like the church at Ephesus who "lost [their] first love." On the other side, there are churches that are seemingly alive with emotion, but are dead in the way of knowledge, to which Christ responds, "I know all the things you do, and you have a reputation for being alive - but you are dead!" Both of these examples contribute to the widening divide between the stuffy churches of yesterday who are content with taking but not giving and the charismatic upheaval seen in recent years, particularly influenced by churches attempting to please millennials in a convoluted way to lull them back to the church, from the opposite spectrum. This is a wise, thorough, gracious, and fair analysis of the Emergent Church movement. Despite their serious concerns with the movement, Kevin DeYoung and Ted Kluck were extremely kind and loving to their brothers and sisters in Christ. Highly recommend the read if you want a helpful understanding of the Emergent Church. They discuss both the good and the bad of the movement, and ultimately conclude with their reasons for why they are not emergent (as you can see in the title). 5 out of 5 stars. Honestly, I haven't done much studying or research on the Emergent Church. I ahve one pastor friend that practices a lot of Emergent ideas that I completely disagree with. Reading this book motivates me to do so. The authors put a lot of research into their arguments which I appreciate. Whether you are in the Emergent movement or against it, I challenge you to read this book. Either way, you will be challenged. Okay, so, let me say straight-up, the only reason this book gets four stars is because Kevin DeYoung manages to carry it despite Ted/Tod/Tom/Tim Kluck's seeming best efforts to bash it into one-star territory with his rambling, pointless "storyteller's approach" to theology. I get that Kluck is there to try and appeal to the younger, story-oriented people who read this book, maybe even deliberately tried to engage on a level that emergent Christians would respond to, but he comes off as a middle Okay, so, let me say straight-up, the only reason this book gets four stars is because Kevin DeYoung manages to carry it despite Ted/Tod/Tom/Tim Kluck's seeming best efforts to bash it into one-star territory with his rambling, pointless "storyteller's approach" to theology. I get that Kluck is there to try and appeal to the younger, story-oriented people who read this book, maybe even deliberately tried to engage on a level that emergent Christians would respond to, but he comes off as a middle-aged guy trying too hard to be hip. Other things I disliked about Kluck--aside from his tendency to tell a story, leave it vaguely unfinished, and then never come back to it again, ever--included his movie references (it seemed like he never mentioned a movie rated anything less than R when using it as an example, probably to seem like someone who is cool and engages with the culture), his tendency early in the book to sound like he was being swayed or wooed or won over by the emergent movement (pg 93 specifically got marked up for this), the way he completely ignored an opportunity to ask actual questions about what D. A. Carson thought about the emergent movement, implied that Carson's opinion didn't matter anyway because Carson is old, and then spent the rest of the chapter talking with a random philosophy/theology major from MSU named Dave (oh dear sweet Jesus in the manger why did you let this chapter happen this way?? There must have been a reason, surely? ), his tendency to dismiss the idea that anyone under thirty could possibly be interested in theology and his dismissiveness of the intelligence and ability to understand complex theological matters of women (this sentence in particular provoked my wrath: "I wouldn't go so far as to put him in the 'rabid young John Piper groupies' department, but if he met a beautiful young girl wearing glasses, no makeup, and an indie-rock T-shirt, reading Calvin's Institutes, he probably wouldn't hesitate to ask her to "court. "), his constant reminding the reader that nothing he says is really all that important anyway aw shucks, and his constant insistence that people might think he's cool, but he's not, really. Seriously guys, just because he's a sports writer who interviews football players all the time doesn't make him cool. Did he mention he interviews football players? Because he does. He totally does. But that doesn't make him cool, just in case you wondered. I wrote this in the blank space between chapters four (Kluck's chapter) and five (DeYoung's): "Abrupt ending. I understand he was trying to get the young perspective on orthodox theology since the younger generation is the one targeted by the emergent movement, but talking to some dude Kluck knows named David vs. talking to D. A. Carson--just. WHAT?? WHO PICKED KLUCK AS DEYOUNG'S CO-AUTHOR? This seems so oddly disjointed and incoherent. It's like they both wrote separate books on the emergent movement and then cut and pasted them together. At least DeYoung still seems completely coherent and well written, despite being chopped up and slapped between Kluck's clucky, disjointed mess." That is still the best analysis of Kluck's chapters I can give you--though he does get more coherent farther into the book, more because he stops interviewing college students and actually interviews a few pastors and theologians instead. Golly gee. Like I said before, though, DeYoung does a really great job at analyzing and explaining the emergent movement's basic tenets (or lack thereof) and then explaining how logically and biblically, the emergent movement doesn't make sense. In fact, a lot of statements that I read in the book (edited to clarify: statements made by emergent authors or churches or pastors, not by DeYoung) on the surface seemed fairly reasonable but almost immediately started falling apart once I thought about them for a little while. Logic, reasoned thinking and the emergent church seem not to mix well. Both DeYoung and Kluck make points of not demonizing the emergent movement, which I appreciated. I have friends in the movement and (living in Grand Rapids, MI, the home of Mars Hill Church and Rob Bell, and therefore a kind of Mecca to the emergent movement) I'm sure there are lots of people around here who I know who espouse some emergent ideals who I know but haven't talked with about this. The authors quote multiple well known emergent figures, from Brian McLaren to Tony Jones to Scot McKnight. They cite a few as being more moderate emergents, who don't hold to the most liberal views in the movement, and they also talk about how the ideas behind the church experience and community the emergent movement pushes are actually not at all bad things. It's not the idea that church can be held anywhere, in any building, that DeYoung objects to, nor is it the idea that the church should be active and engaged with the community around them. It's the idea that we throw out theology and "knowing things" about God and Jesus that he finds so troubling. I have to agree. Worth reading the whole thing, but if you only have a little bit of time, the last chapter provides a great summary of what we need to be careful of as we try to discern how God calls us to live as Christians. I totally read this too late. The Emergent Church is dead I think. It was still a decent read though. "Semper reformanda!," the pastoral battle-cry of the Reformation meaning "always reforming," has reemerged (no pun intended) itself onto the "post-evangelical" tongue through the leading voices of the Emergent conversation. (Note: This review, unlike the book itself, will distinguish between Emergent and Emerging; defining Emergent as a methodo-epistemological philosophy, whereas those Emerging don't so much forsake knowledge at the cost of method.) The authors make the point to examine the Emer "Semper reformanda!," the pastoral battle-cry of the Reformation meaning "always reforming," has reemerged (no pun intended) itself onto the "post-evangelical" tongue through the leading voices of the Emergent conversation. (Note: This review, unlike the book itself, will distinguish between Emergent and Emerging; defining Emergent as a methodo-epistemological philosophy, whereas those Emerging don't so much forsake knowledge at the cost of method.) The authors make the point to examine the Emergent tendency toward historical reconstructionism and here is just another example of history without context (or, in this case, history with a new context). The way we hear semper reformanda interpreted today by Emergent leaders is something along the lines of "reforming the church in order to be culturally relevant", or, as Emergent icon Brian McLaren suggests, "our (the church?) message and methodology have changed, do change, and must change if we are to remain faithful to the ongoing and unchanging mission of Jesus Christ (Brian McLaren, A Generous Orthodoxy, p. 214)." McLaren already suggesting earlier in his popular manifesto that our message and method need "high changes" (ibid., 213). What interests me is what perverted form of logic looks at Jesus as the objective by which ones missions is evaluated, calls that Objective "unchanging," then proceeds to say from this that our message and method need changing? Again, McLaren states, "I can't see church history any other way, except this: semper reformanda, continually being led and taught and guided by the Spirit into new truth (ibid., 215)." Compare this to how the Reformers of the 15th and 16th century used the term in order to connotate a reforming TOWARD the Holy Scriptures NOT toward the culture. Do you remember what the Reformers were reforming? Not Rome because she had become disengaged and no longer relevant to the culture, but because she had become disengaged from the plain reading of Holy Writ. The concept behind semper reformanda is that we are sinners who can misinterpret Scripture and when we realize we have we are to reform back to the principles within the Scriptures them self. Beyond that, the semper reformanda was a call to holiness. The Christian life should be marked by a life being reformed. Reforming to what? to the culture? No, being reformed by being conformed to the image of Jesus Christ. This is a major part of the gospel our Emergent friends leave out of their "conversation." This book is an important warning about the errors of the emergent church movement (oops, I mean un-movement). It is well researched and clearly presented and maintains a gracious spirit throughout, carefully pointing out that some of the emergent emphasis is a reaction to and an attempted correction of some genuine follies and foibles of present day evangelical Christianity. The alternating narrative and didactic chapters made for an interesting format that likely will appeal to those attracted This book is an important warning about the errors of the emergent church movement (oops, I mean un-movement). It is well researched and clearly presented and maintains a gracious spirit throughout, carefully pointing out that some of the emergent emphasis is a reaction to and an attempted correction of some genuine follies and foibles of present day evangelical Christianity. The alternating narrative and didactic chapters made for an interesting format that likely will appeal to those attracted to the "story" emphasis of the postmodernism-infused emergent church as well as satisfy those more systematic types who just want the straight goods on this "conversation". For a movement which resonates with many so-called evangelicals, it is dangerously errant in both doctrine and practice. However, as far as movements go, practice generally follows doctrine so it will likely take a while for the life of emergent churches to fully realize and apply the tenets which they hold...but it will come, and the authors seem to sense this as they raise the red flag. Many if not most of the movers within the emergent "conversation" either reject, are antagonistic toward or are at least foggy or mushy on such cardinal doctrines as the substitutionary atonement, justification, imputation, foreknowledge/sovereignty of God, God's judgement/punishment of sin, and infallibility/authority of the Scriptures and instead are very friendly toward or simply embrace such unbiblical innovations as open theism, moral influence theory of the atonement, downplaying justification for lifestyle ("it's not about what you believe but how you live"), and are too individualistic in their soteriology (like everything else) to even begin to understand covenant and its implications for God declaring people guilty in Adam and righteous in Christ. On such issues as sin and its consequences, one would be hard pressed to hear much at all as most emergent types see this as a hindrance to the "conversation" and simply don't mention it. And there are already clear warning signs about where all of this mush-think will practically lead with the emergent movement being hesitant to mention if not outright opposing the Bible's clear teaching on such issues as human sexuality, human dignity (abortion), etc. Though sometimes it takes some digging to discover, the emergent church has far more in common with several of the prominent heresies in the church's history than it does with the orthodox and biblical faith. I fear that this book and others like it, while valuable resources, will prove to have been far less critical than they could or should have been as this trend spreads and progresses. If one spends even a little time reading church history, one can see the damage that these doctrines have done to the faith when they have been embraced in the past by various groups. It's not hard to emergine...err, I mean imagine those things happening again. I wish more people who are uncritically "engaging" in this "conversation" would spend the time and effort to compare it with the church's standard, Scripture, as the authors of this little book have done. All in all, the emergent church is just a cooler, hipper version of a watered down, severely edited, seeker-sensative movement, only with candles, jazz and cappucinos. Engage with this book. 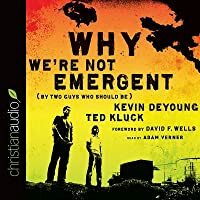 Why We’re Not Emergent: By Two Guys Who Should Be, by Kevin DeYoung and Ted Kluck is a great resource if you want to find out about Christianity’s Emergent Movement. In eleven chapters DeYoung and Kluck tag-team their way through the maze that is the Christian postmodern (emergent, emerging) belief system. It’s tricky in that it comes from no one spokesperson but a network of people across denominations who endorse each other’s books, interview each other, and seem to be generally affiliated. DeY Why We’re Not Emergent: By Two Guys Who Should Be, by Kevin DeYoung and Ted Kluck is a great resource if you want to find out about Christianity’s Emergent Movement. In eleven chapters DeYoung and Kluck tag-team their way through the maze that is the Christian postmodern (emergent, emerging) belief system. Postmodernity: “The postmodern Way, as Leonard Sweet puts it so candidly, is an experience. The journey is more wandering than directional, more action than belief, more ambiguous than defined” - Kindle Location 417. DeYoung and Kluck do an excellent and balanced job pointing out that the Emergent movement is liberalism repackaged. But they successfully show how it is not even a solid reproduction since its leaders (Rob Bell, Dan McLaren and Doug Pagitt) have not only failed to learn their Bible or church history, but they completely misrepresent and distort it. The authors researched their subject very well and provide a point counterpoint exposé, citing quotes and interviews with the most notable Emergent DeYoung and Kluck do an excellent and balanced job pointing out that the Emergent movement is liberalism repackaged. But they successfully show how it is not even a solid reproduction since its leaders (Rob Bell, Dan McLaren and Doug Pagitt) have not only failed to learn their Bible or church history, but they completely misrepresent and distort it. The authors researched their subject very well and provide a point counterpoint exposé, citing quotes and interviews with the most notable Emergent voices. A must read for all that will leave you vacillating between a series of emotions; outrage, disgust, pity and thankfulness. Outrage because you come to recognize how the “leaders” of the Emergent/Emerging movement are striping away the very power, purpose and meaning of the ministry, life and work of the Jesus that they claim to love. Disgust as they undermine God’s Word of its foundational importance to the life of the believer. Pity as these Pied Pipers lead people to the very judgment and hell they deny, and the “gospel” they offer has no good news for its followers, as they have rendered it meaningless and having really no purpose in the life of a believer for salvation, sanctification or our future glorification. And finally a feeling of thankfulness that this movement has no staying power since it is very apparent that it is all sound and fury signifying nothing, and by its very nature will burn itself out since its adherents will eventually realize that while its leaders stand for “everything” they really stand for nothing at all. Without a doubt there are some things that the Conservative Evangelical church could do better and some ideas that thankfully are being addressed; e.g. a better focus on doing justice and loving mercy as well as being diligent to avoid politicizing and moralizing. However the Emergent church is like the driver who has gone into a skid on an icy road, and over corrected so dramatically that instead of landing in the ditch on the right, the course they have set is heading over the steep cliff on the left. Hopefully the “guard rail” of God’s Word and the Holy Spirit can stop the car for those on the Emergent “spiritual journey” road to destruction and set their wheels back on the straight and narrow. DeYoung puts it very succinctly when he states; “I’m sure emergent Christians are sincere in their love for Jesus, but what kind of love is it that makes so little of His glory as the long-awaited Messiah and the Son of the living God (Matt 16:16), the Alpha and Omega (Rev 1;8), the righteous Judge (2 Tim. 4:8), the conquering King who rules the nation with a rod of iron (Rev. 2:26-27), the great I am (John 8:58), and the Lamb who was slain to take away the sin of the world (John 1:29)?” A movement with “leaders” that strip away the beauty of the Gospel offers nothing but empty platitudes and is a meaningless journey on the road to nowhere. The emergent church and its ideas appeal to me. On page 20 of this book, DeYoung starts a somewhat tongue-in-cheek sentence that begins with, "You might be an emergent Christian if..." and definitely several (but not all) of the items apply to me: I always use a Mac (haha), I don't like GWB too much, I am concerned about "poverty, AIDS, imperialism, war-mongering...global warming, racism, and oppression," and the list goes on, though DeYoung's tone seems to get more and more demeaning as his run The emergent church and its ideas appeal to me. On page 20 of this book, DeYoung starts a somewhat tongue-in-cheek sentence that begins with, "You might be an emergent Christian if..." and definitely several (but not all) of the items apply to me: I always use a Mac (haha), I don't like GWB too much, I am concerned about "poverty, AIDS, imperialism, war-mongering...global warming, racism, and oppression," and the list goes on, though DeYoung's tone seems to get more and more demeaning as his run-on sentence continues. Though I didn't grow up in a traditional evangelical, white bread, all-rules and no-love church that many emergent Christians seem to claim as their background, there are many reasons why I sympathize with the movement (or discussion, or whatever). First, I really like culture. What I mean by this is that I like the concept of "engaging with the culture" as the apparently cliché saying goes. Second, I enjoy using terms like "keeping the church relevant," and "ushering in God's kingdom," and I like the emergent church's ideas on social justice, environmental stewardship, and modeling our lives on that of Jesus. Third, I really liked several books mentioned by the authors of "Why We're Not Emergent," including Donald Miller's "Blue Like Jazz" and Brian McLaren's "A Generous Orthodoxy," for various reasons. I think the only other book they mentioned that I have read is Rob Bell's "Velvet Elvis," which I wasn't as crazy about but I definitely thought it was worth reading. All that being said, DeYoung and Kluck make some really good points. The emergent church needs to keep to some simple truths that are not "up for discussion." Theological positions are necessary and beneficial because ultimately without them the message of the Bible gets watered down to the point of (possible) heresy. Central core beliefs of the Christian faith - things like the cross, the resurrection, eternal life, heaven and hell, the inerrancy of Scripture, salvation by faith - these need to remain, as the label I have given them suggests, at the core. The authors I feel sometimes get a little carried away (especially Kluck) with making fun of emerging Christians, and I felt that was unprofessional and probably unnecessary. Overall, DeYoung and Kluck (mostly DeYoung) made a strong, well-researched (I liked that) position on why they are not emergent. Personally, I don't think I am quite in the emergent camp myself (despite my tendencies), but it was still good to learn from two people solidly on the outside and be able to compare my own beliefs and values to theirs. Going into this book, I knew next to nothing about the emerging/emergent church, and this was a great resource for getting up to speed on some of the strengths and weaknesses of the movement. The movement is notoriously difficult to pin down, as they eschew creeds and there is no ready definition of "emergent," so the authors pieced together what they could from the written works of some of the more popular authors/pastors who have self-identified as emergent. The authors freely admit that the s Going into this book, I knew next to nothing about the emerging/emergent church, and this was a great resource for getting up to speed on some of the strengths and weaknesses of the movement. The movement is notoriously difficult to pin down, as they eschew creeds and there is no ready definition of "emergent," so the authors pieced together what they could from the written works of some of the more popular authors/pastors who have self-identified as emergent. The authors freely admit that the sources they consulted may not speak for the movement as a whole and that they may be misunderstanding the beliefs and attitudes of emergent Christians. The criticisms themselves were well thought out and scripturally supported. The writers had no perceptible animus for the emergent church or the people involved with it; their declared intent is to hold the movement up to the light of scripture and point out areas of strength and truth as well as weakness or falsity. I particularly appreciated the humble and gentle tone of the book--this is not a bombastic dressing down, but a measured and respectful questioning. The writers are clearly dedicated to truth, and do not compromise the bible in order to be conciliatory, but neither do they attack or vilify the leaders with whom they disagree so strongly. As the authors themselves state, there may well be emergent Christians and leaders who adhere to orthodox theology (for example, Mark Driscoll at Mars Hill in Seattle has identified with aspects of the emerging church and yet adamantly espouses Reformed beliefs). However, many of the best known leaders associated with the movement seem, from the excerpts presented here, to be preaching a gospel of works (that is, orthopraxis) at the expense of faith (orthodoxy), to such a degree that some are flat out ignoring or denying vital doctrines like sin, atonement, wrath, and judgment. If this is in fact the case, they are preaching a false gospel. As for the writing itself, there are a few editing errors, but other than that, it's fairly well written--in a laid back, slow-paced and conversational style.